Here's the help section for all things Guitar Tab Creator. 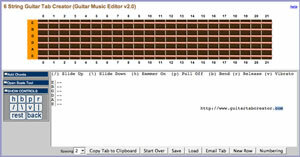 The idea for Guitar Tab creator is to have a simple online tool for making guitar tab, which required no special software to install on your computer. It is designed for guitarists who want to make guitar tab that easy to make, and easy to post to your favorite forums or social media sites. Because Guitar Tab Creator is available on the internet, it is as portable as you are! 1. A realistic fretboard for easier tabbing! Guitar Tab Creator allows you to create easy to read guitar tabs that can be shared with your friends or easily posted to your favorite forums. Start using Guitar Tab Creator.